This paper explores how sound artefacts within urban acoustic ecologies can inform our perceptions of place, engaging a new dialogue with the cultural and built histories of post-industrial Tasmanian urban environments. Two modes of inquiry underpin this research. The first concerns sound as a cultural palimpsest that exists - often subliminally or beneath consciousness - across urban environments, which the paper argues can be materialised as sonic artefacts through various recording, production, playback and installation techniques to provide an interpretive window into the histories of place. 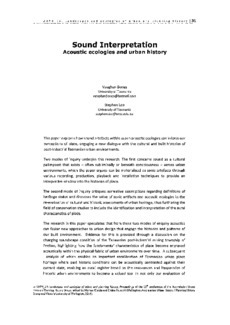 The second mode of inquiry critiques normative assumptions regarding definitions of heritage status and discusses the value of sonic artifacts and acoustic ecologies in the re-evaluation of cultural and historic assessments of urban heritage, thus furthering the field of conservation studies to include the identification and interpretation of the aural characteristics of place. The research in this paper speculates that from these two modes of enquiry acoustics can foster new approaches to urban design that engage the histories and patterns of our built environment. Evidence for this is provided through a discussion on the changing soundscape condition of the Tasmanian post-industrial mining township of Zeehan, highlighting how the fundamental characteristics of place become engraved acoustically within the physical fabric of urban environments over time. A subsequent analysis of which enables an important recalibration of Tasmanian urban place heritage where past historic conditions can be acoustically contrasted against their current state, enabling an aural register based on the resonances and frequencies of historic urban environments to become a valued tool in not only our evaluation of heritage status, but in determining appropriate responses when dealing with the conservation of urban environments.